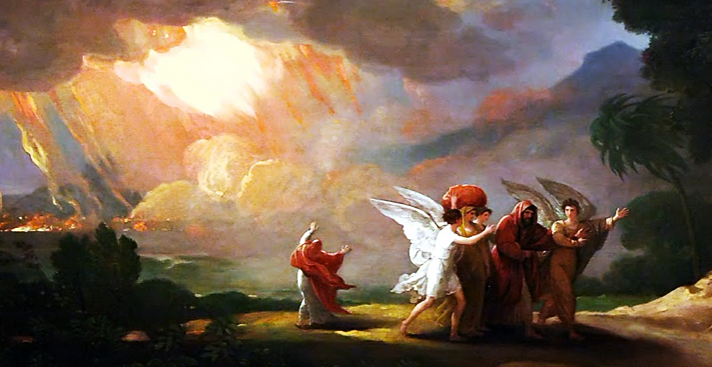 It is moving, the story of Lot with his family being saved from the fire of Sodom. The inhabitants of this city had put the finishing touches on their infamies, the day had arrived where God would take a glaring vengeance. But there was there one family that was just. Two angels under a human form presented themselves to Lot. We are going to destroy this guilty city, they said to him, take with you your wife and your children, and leave. The moment arrived, Lot seemed to hesitate. They took him by the hand and dragged him, saying: Save yourself, lest you perish with the others, and walk without looking behind you. The commenters think that these were the envoys of Saint Michael, who stayed with Abraham, who saved Lot and his family. He will so save the families who have remained worthy of the kindly look of the Most High. Visit, Lord, this house and cast away from it all the pitfalls of the enemy; may your holy angels who live there safeguard us in peace and may your blessing be always upon us. Hear us, Lord, and deign to send from heaven your holy angel, to guard, support, protect, visit, and defend all those that your Providence has gathered under this roof. Amen.